Yesterday afternoon, #WCSoiree was going down at Chicago's Water Tower and I did not have a babysitter for V. All of my social media friends were going so I did what any SAHM blogger would do, I took her to the party with me! I only considered leaving her at home with an iPad and a couple of pbj sandwiches for a second (I kid). 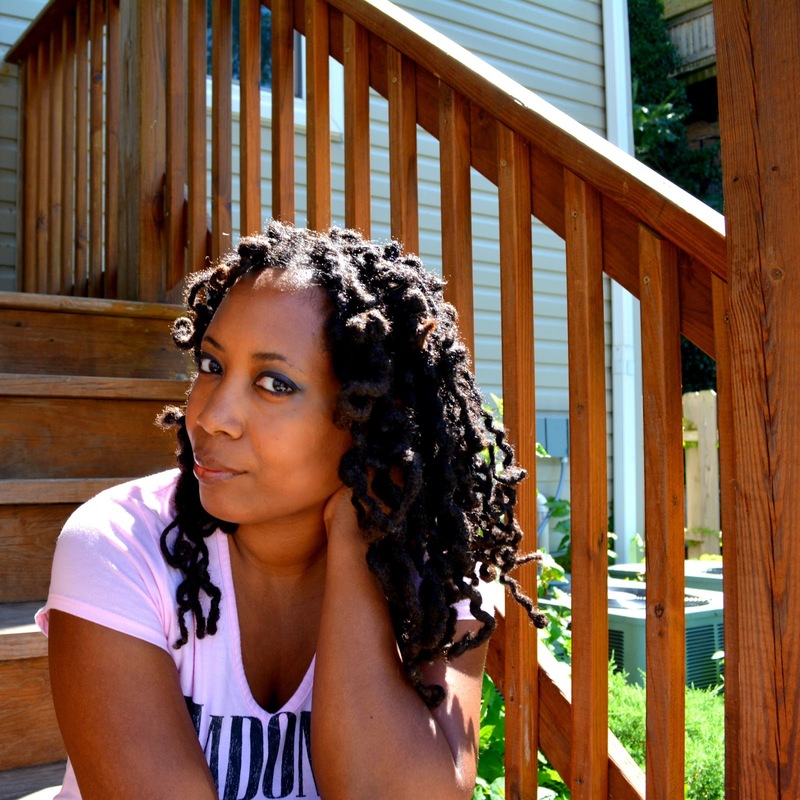 What's a stay at home mom to do, style wise, in this situation? I briefly thought about donning heels but my feet said "don't do it, girl". Glad I listened to them. Instead, I wore wedges. It was a breeze going up and down escalators and picking V up when she was feeling left out of the conversation. They are only slightly old lady. They get a pass for amazing comfortable and a snakeskin print. I'm surprised that this is my first time wearing the floral midi skirt this summer. I was all over it last winter. I thought I would wear it more this summer. It looks better with heels though so it fits into my "going out sans V" clothes but I have better looking "no V allowed" clothes to wear. It had been pushed to the dark side of the closet. The Madonna tee is not really from the 1987 Who's That Girl World tee. It's a 2011 reproduction of the new vintage 80s. V had a onsie like this when she was a newborn so I got all nostalgic of that time and took this .99 Salvation Army find home. It's really soft and broken in too. Sidenote: Gap makes great tees and jeans! We both had a great time. We watched Afrobella rip the runway; saw Mrs. Houseful looking like she belonged on the runway; made it into a couple of stores for the fashion mission; and spent time with Auntie Girl Get A Life. All of that and we were home by 8p, only an hour past V's bedtime. Visit my #WCSoiree G+ album for more pics from the great afternoon including a cute yet photo bombed pic of V and Auntie. I love that Madonna t-shirt! LOVE the Madonna tee, vintage or not! Your wedges are definitely not "old lady." I'm glad you BOTH got to have fun! 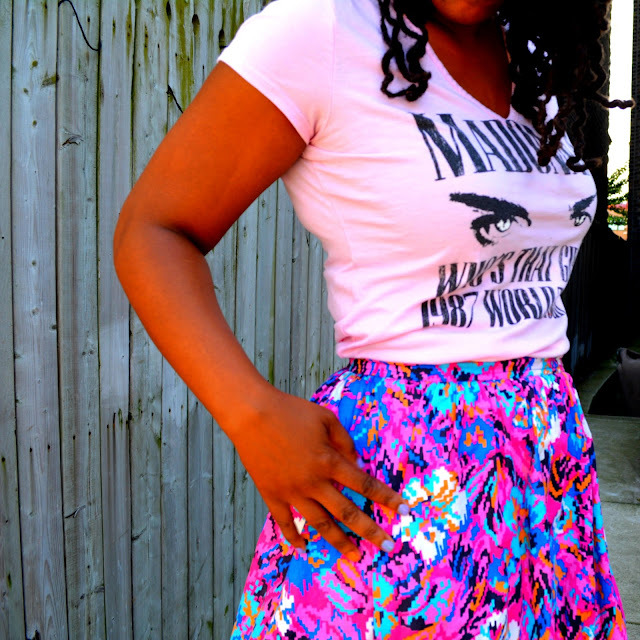 I love the print skirt and yeah, the Madonna top is pretty rad! I really like your hair too. 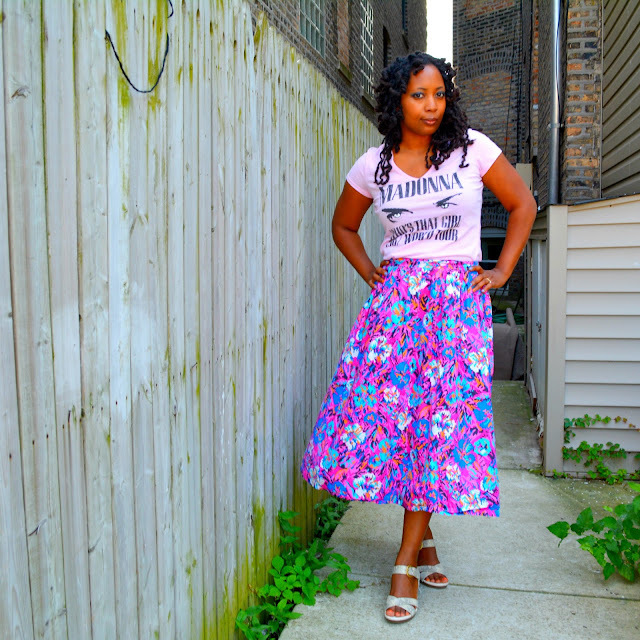 I invested in midi floral skirt. Not sure what top I'm going to pair it with but I'm thinking a neutral tank will be best. Love the colors! So awesome you took your daughter! You look so cute! 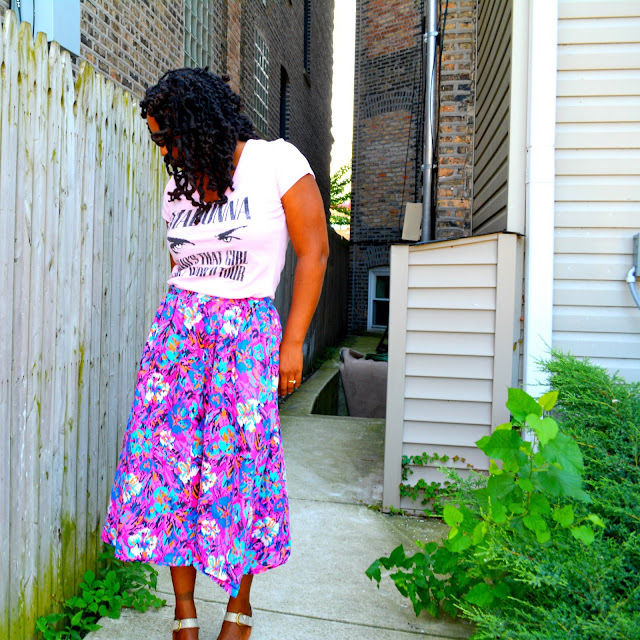 I love floral and this skirt is no exception! Such a cute look! 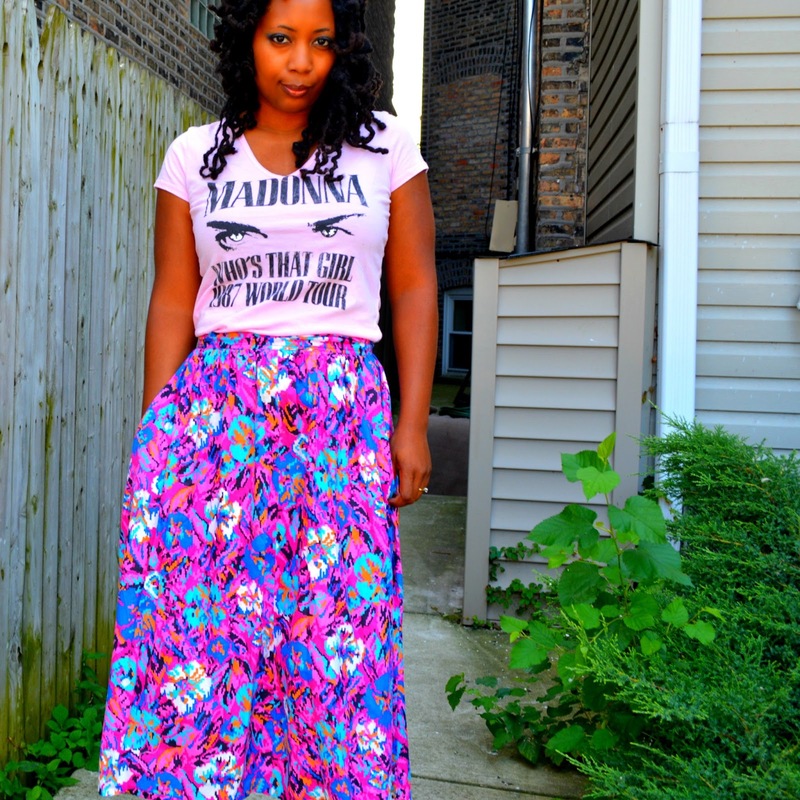 Love the skirt and the Madonna tee! CUTE!